Islam is one of the most widely practiced religions across the globe. However, it is highly shrouded with biases and stereotypes, especially in the present when Islam is being clubbed with terrorism. With the homogenizing of Islam and Muslim identities as a monolithic set of values, culture and ethics, we tend to ignore the fact that Islam is a religion as diverse as any other. 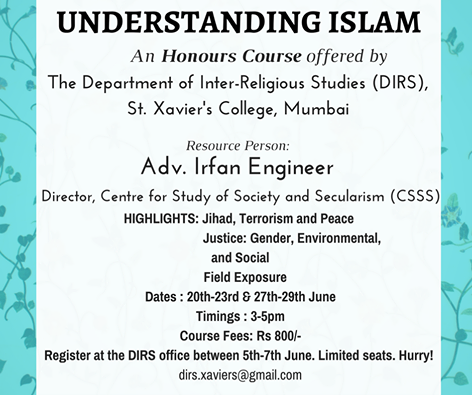 ​Our first honours course this year is Understanding Islam. This course aims at facilitating students to understand the basic tenets of Islam and critically analyse their own beliefs and views on Islam. The course will present a spectrum of beliefs, views and narratives of Islam and Islamic perspectives on contemporary issues like climate change, gender and sexuality, family and social justice. 20-23 and 27-29 June, each day from 3 pm to 5 pm. The course schedule also includes field exposure. Registrations are open at the DIRS Office from 5 June to 8 June. The course fee is Rs. 800.